How long has it been since you’ve checked your LinkedIn profile for personal or professional reasons? How long has it been since you considered LinkedIn as part of your company’s overall content marketing strategy? LinkedIn is usually a second thought in content marketing. We know that LinkedIn isn’t as fun or creative as Facebook or Snapchat. Brands who like to kick back and be more approachable may not enjoy posting or spending time on the platform as much. If you ignore LinkedIn, however, you could be ignoring a piece of the content marketing puzzle that could skyrocket the amount of leads you generate. 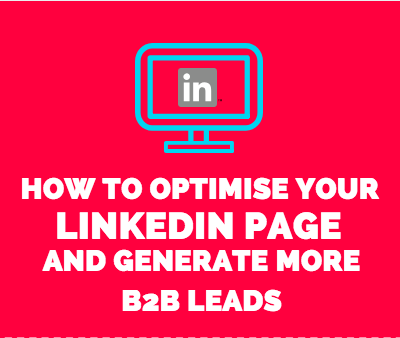 Use this guide to learn about the importance of LinkedIn for B2B businesses, how to optimise your page to generate more leads, and how you can integrate LinkedIn with the rest of your overall B2B marketing strategy. LinkedIn plays more of a role in generating B2B leads than you may think. A whopping 80% of B2B leads come from LinkedIn. Eighty percent. That is four out of every five B2B leads. Facebook, Twitter, and other social media sites are great for establishing your brand and engaging with customers, but LinkedIn is where things get serious. This means if you’re slacking on LinkedIn, you may be handing over leads to your competitors. When leads are on LinkedIn, they are ready to give out their contact information and learn more about a company. Capture their attention with a highly optimised, professional page that puts your company’s name in the running for their business. Optimising LinkedIn has a slightly different approach and focus than overall search engine optimisation, but many of the same concepts can be applied to your LinkedIn pages and your landing pages. Be Clear and Concise with Your Copy. Your LinkedIn page may be the first exposure someone has to your company. If you don’t get your message across fast enough, these users will click away fast. Get your message across fast with concise copy. What do users want to know about you when they first visit your page? What services are they looking for, and whose LinkedIn pages are they looking at before and after your page? If you can answer all of these questions and create copy that answers what users want to know, you will maximise the amount of leads that you can generate. Be consistent with your message so users can recognise your company when they see your websites or other social media pages. Consistency isn’t just important in copy; be consistent in the way you format your content. Check spelling, grammar, and any outbound links that you may be using in your LinkedIn copy. Don’t forget about keywords! LinkedIn has a variety of search feature that potential leads will use within the site. Conduct keyword research before you write your copy for LinkedIn and your other social media platforms. Photos may be more important on LinkedIn than Facebook or Twitter. Studies show that LinkedIn users spend 20% of their time looking at the photos on a profile’s page. If your photo doesn’t fit in with the rest of your copy, you may be sending a confusing or inconsistent message. Even if you are just using your company logo for your photo, make sure the photo is high-quality and compatible with all devices. (57% of LinkedIn views come from mobile devices.) Eliminate text that is too small or hard to read. If you are taking an actual photograph, never underestimate the power of a smart photo on a simple background. Dress your best (at least from the torso up,) and take the time to retouch the photo if there are any imperfections or lighting issues. Offer a service for employees to get LinkedIn photos. If everyone’s photo looks consistent and tells a similar message, you will communicate a clear message of brand unity. Get Involved and Use Available LinkedIn Features. Have you fully explored all of your options with LinkedIn? You may be surprised to learn that the site offers an extensive variety of lessons, groups to join, and ways to boost your partners and team up. Spend some time browsing the platform for different ways to become an expert and get your company’s name out there. Be sure to download the LinkedIn extension for Google Chrome so you don’t miss out on any notifications or potential communication. Since LinkedIn has instant messaging, it’s important to get back to messages as soon as possible. Publish Content Relevant to Users. LinkedIn, like Facebook or Instagram, has a platform for posting, sharing, and interacting with content. If your company simply wants to post links to your website’s blog or other social media content that you have already posted, you can do so. However, if you believe that this content can be tweaked for your LinkedIn audience, you can also post text, photos, and videos specifically for LinkedIn. Posting straight on LinkedIn allows users to easily view content if you share the content in LinkedIn groups or other forms of engagement. Include Your Profile Across Your Social Media Profiles. How are potential leads finding your LinkedIn profile? They may be searching in the app or on search engines, but there are more opportunities to reach out to interested users. Include a link to your LinkedIn profile on your website, in email newsletters, and across social media platforms. If you are posting content on LinkedIn, you can use this “event” to create additional social media content. Reach Out to Employees with LinkedIn Pages. Your company’s online reputation relies on more than just the social media pages that you have access to. Think like a potential customer, and browse through the LinkedIn pages of anyone who could potentially be attached to your company. If someone’s professional page isn’t up to par, it could have a negative effect on the way that your company is perceived by others. Run a crash course or put together resources for employees who are on LinkedIn (or who want to join.) Offer these tips and any other advice that you feel are appropriate for your brand. If you can help employees look smart online, you will boost the optimisation and reputation of your overall company. Target Updates To Your Audience. Note that companies must have 300 followers before they can start targeting updates to different customers. How do you know that your copy is killer and your overall page is doing all that it can to generate leads? Measure impressions and engagement before and after you make specific changes to your LinkedIn. More in-depth analytics are exclusive to LinkedIn Company pages, so take advantage of any data you can collect. Continue to test and measure your LinkedIn efforts; as the app continues to change and expand its features, your business should add more content, use more features, and consistently update your information. LinkedIn Is Just One Content Marketing Tactic To Consider This Year. If you are focusing on revamping one social media platform, it’s important to think about all of your social media platforms. Consistent marketing and branding is essential for a seamless transition across different channels. Similar copy and tone also helps to make the copywriting process less time-consuming; if you are using similar taglines and branded words to describe your company, you will spend less brain power and time creating completely original and fresh content. A comprehensive social media and content marketing strategy can make the transition through the sales funnel an easier process. If you are working on optimising your entire content marketing strategy, reach out to the experts. Digital Squad can help you through every step of creating and implementing an effective content marketing strategy for your business. We conduct thorough keyword research and talk through buyer personas that you want to reach with your strategy. Our expertise and wide range of experience with content marketing allows us to create content that generates leads and put that content in front of your target audience. Reach out to a content marketing specialist today to learn more about how to further optimise your LinkedIn page and create a content marketing strategy that propels you to your growth goals.